Depending on the other settings (e.g. 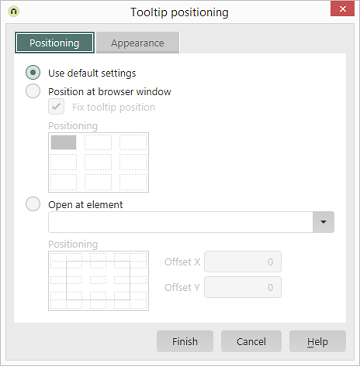 a modally opened tooltip), the previously used positioning will be applied. With the standard setting, the tooltip will, for example, always orientate itself to the button clicked on. If this setting is selected, the tooltip will orientate itself to the browser window. Click on the graphic below this setting to determine the position of the tooltip relative to the browser window. With this setting, the tooltip stays at the assigned window position and does not scroll with the page's content. You can select an element here at which the tooltip should be opened. Here, the element will be symbolized with a border and green dots. The greyed-out areas around the dots correspond to the later position of the tooltip. In the positioning schema, click on the position where the tooltip should be opened. An additional offset from the element can be specified in pixels here. Offset X offsets the tooltip horizontally and Offset Y vertically. 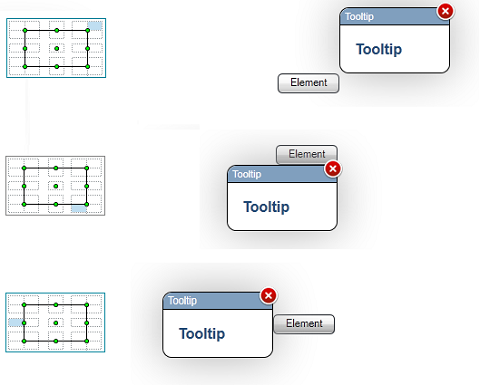 In the following figure, you will see a few examples of how the positioning (without offset) will be implemented in the browser.